“It was a bad idea from the beginning,” said Sara, “I knew my mom would hate me for a little while, but I thought it was just something I had to do.” Speaking about getting her boyfriend Mark’s name tattooed on her body, my friend Sara recently recalled what she refers to as “one of the worst decisions ever”. You may have already guessed by now that she and Mark are no longer an item. And she has since gone ahead and had the tattoo removed thanks to Laser Tattoo Removal treatments. Doing so, she says, gave both herself and her mother a great deal of relief. That is because tattoos, of course, are meant to be permanent. “I thought it would be a mistake that I would never be able erase. Thankfully, the treatments helped to get rid of that bad idea,” exclaimed Sara. Laser Tattoo Removal is able to remove tattoos because the ink is placed in the dermis layer of the skin. It is a lower level of skin than the surface, but naturally the ink can be seen through the top layer. The procedure emits high amounts of energy into the dermis layer of skin to specifically target and destroy ink particles. It is the only way to remove the tattoos without scarring the skin. After all, tattoos have already made a mark that is considered permanent. The last thing you want is another mark reminding you of the one that was there before! “Ow! Quit it!” Bart would exclaim with each and every hilarious poke. “I really thought it was going to hurt,” remembers Sara, “Thankfully, my experience was nothing like Bart’s.” Laser Tattoo Removal uses was it known as a Q-Switch Laser. In my next blog, I’ll review an article that appears on CNN’s website. It praises the use of such a laser for the purpose of removing tattoos over other injury-inducing procedures. Such lasers are also used in the lightening of tattoos. But most patients require between four and eight treatments in order to completely rid themselves of their “bad ideas”. 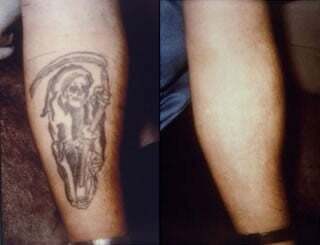 Of course, this all depends on the size and colour of the tattoo that is being removed. But, as always, you will need to consult with your skin care specialist or clinic first.